The museum, inaugurated in April 2002, has been named after Masaccio, the painter who opened the great age of the Florentine Renaissance, whose first known work is displayed in the adjacent parish church: the famous triptych of Saint Juvenal, dated 23rd April 1422. Coming from the nearby small church of SanGiovenale, it has been housed here since 1988 for reasons of security and propriety. 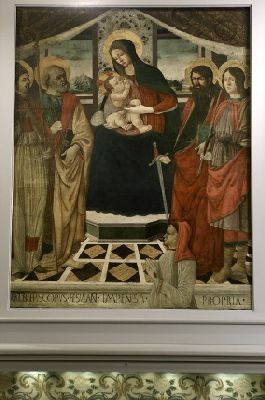 The museum has devoted to the painting of the Madonna enthroned with Child and four Saints an entire room of documentation equipped with didactic panels and computer supports. The visitor can look over them either before or after visiting the parish church, one of the most harmonic and suggestive of the Tuscan Romanesque monuments. 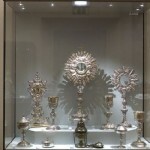 But the museum, which one enters through the church apse and is housed on two floors, also displays paintings and precious objects belonging not only to Cascia but also to other important churches of the territory of Reggello, such as: S. Agata in Arfoli, S. Donato in Fronzano, S. Margherita in Cancelli, all of them ancient and endowed with a valuable artistic patrimony largely unknown until now. 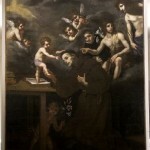 Among the paintings to be pointed out are: an important panel from the School of Ghirlandaio (end of 15th century), once exhibited on the main altar in Cascia, a sorrowful Deposition by Santi di Tito (1611), an ascetic Saint Anthony by Jacopo Vignali (17th century). 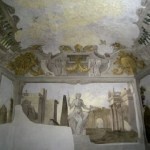 Other works currently under restoration will be added to the works already on display, including a very beautiful panel by the Florentine School of 1575. In the five rooms, one of which is decorated with elegant wall paintings from the first half of the 1700’s discovered under the plaster and recently restored , we also find real treasures of sacred jewelry of the 15th-19th centuries: among these are to be pointed out: the Astylar Cross of the 1400’s in copper engraved on two sides, the Monstrance in silver and rock crystal of the 18th century, the wooden sculpture of Saint Nicholas of Bari (18th century) which still retains its clothing madeof precious fabric, a chalice in gilded copper with niello-wrought silver inserts of the 14th-15th centuries and two ampullas from the 1700’s with an open pattern in silver. Finally, in a small display case there are Russian icons and objects used in Jewish ceremonies, a sign of the desire of documentation that goes well beyond the local artistic heritage. 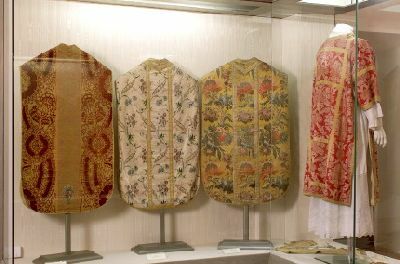 The section of liturgical hangings is particularly rich, a real little museum of fabrics that includes examples of the 15th-20th centuries: among theseare to be pointed out a chasuble made of lampas and velvet in silk and gold and a damask dalmatic with thistle flower motifs of 16th Century Tuscan manufacture. 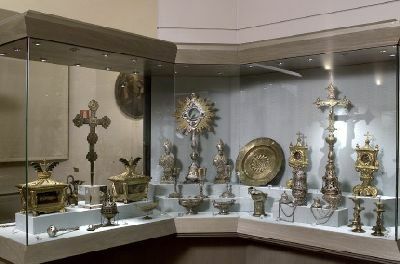 Another sector, which is given prominence, is that of the Ex-voto, accumulated, out of popular veneration, around the ancient wooden Crucifix of Cascia and the Madonna of Comfort of San Giovenale: there are precious rosaries, coins and medals of the 17th and 18th centuries, small jewels including a cross in rock crystal of the 1600’s, elaborate baptismal medallions in filigree. One room, meant to contain the historical archives of the Parish, has been furnished with: portraits of the series of parish priests in charge between the 17th and the 19th centuries (including one painted by Pier Dandini, 1646-1712) as well as precious ancient documents. The museum supports the parish church, (which has been for some time, the seat of meetings on Masaccio and his triptych, concerts, theater performances, conferences, small exhibitions), in its promotion of important cultural initiatives. 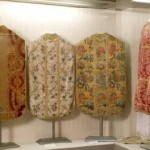 Size: central panel: 108 cm. x 65 cm. ; side ones: 88 cm. x 44 cm. 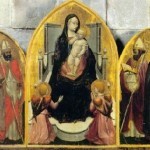 Madonna Enthroned with Child and Adoring Angels between Saints Bartholomew and Blaise, Juvenal and Anthony the Abbot. 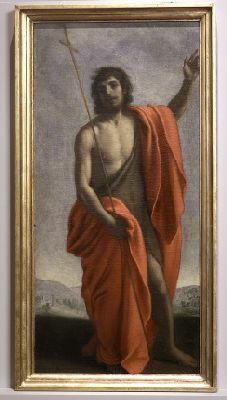 It is Masaccio’s first work, painted when he was only 21 but which already shows his distinctive plastic characteristics. 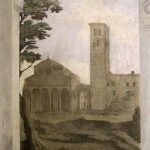 Typical of the “architectural illusionism”, the painting creates the effect of an open loggia with various views. In the main view, surrounded by beautiful classical buildings, there is a female allegorical figure with the symbols of power. On the other hand, the ceiling simulates a balcony that opens onto the sky and is surrounded by plants and large coats-of-arms with allegorical depictions and garlands. Size: 92.5 cm. x 43.5 cm. 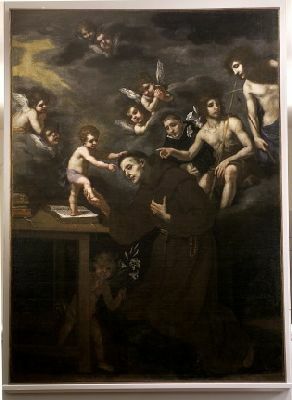 The painting, a companion to the one dedicated to Saint Bridget of Sweden, is signed ZR, which has permitted its attribution to Rosi, one of Cristofano Allori’s assistants. The iconography follows the traditional model with the saint holding the cross, while wearing a camel hide and a red mantle. The robust vivid effects of colour give the figure a strong dramatic pathos and a very clear tension. Size: 212 cm. x 135 cm. The painting uses colors that accentuate the event’s dramatic nature, with a strong naturalism in the onlookers’ features that softens their features and makes their emotion for this event more credible. 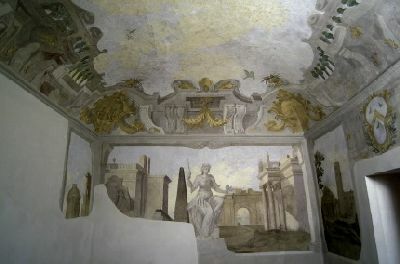 Detail of the wall paintings in the Parish Priest’s Chamber with the view of the parish church of Cascia. 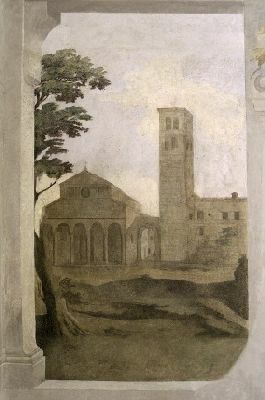 The artist curiously depicts here the image of the Romanesque façade and not the baroque one as it was at his time. Size: 92.5 cm. x 44 cm. 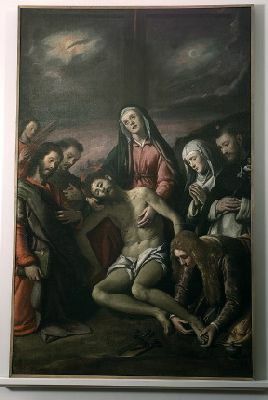 The painting is a companion to the one dedicated to Saint John the Baptist, and is signed ZR, which enabled its attribution to Rosi, a close associate of Cristofano Allori. 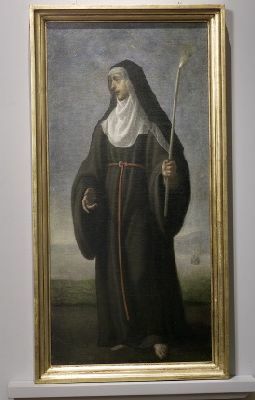 The figure of the saint, depicted here following the traditional iconography in a nun’s habit and holding a lit candle in memory of the mortification that she inflicted upon herself with a flame. The high quality of the painting is highlighted by the skillful use of the vivid effects of colour. Size: 195 cm. x 151.5 cm. 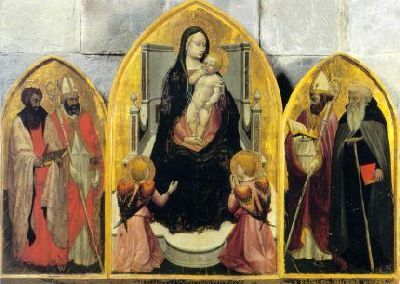 Of special interest is, in the lower right, the portrait in profile of the painting’s purchaser, the bishop of Fiesole (1481-1504) and former parish priest of Cascia, Roberto Folchi, depicted at an advanced age. Size: 226 cm. x 116 cm. This large painting is not always on display in the museum but it is a work of remarkable artistic and spiritual importance. Its most touching element is the angel in the lower part who instructs the observers to be silent. Size: 58 cm. x 28 cm. 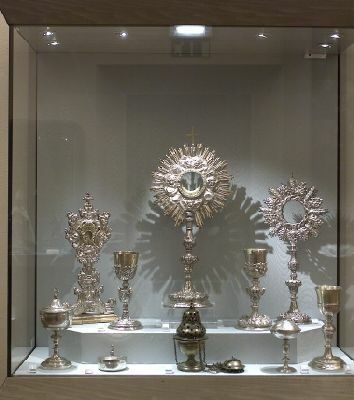 This is one of the museum’s most refined monstrances. The customary typology of the sunburst and clouds is embellished by semi-precious stones placed along the edge of the circular casket. By car: coming from the motorway A1 exit in Incisa and follow the directions towards Reggello. By bus: bus service from Firenze (Piazza Adua). Saturdays on July and August evening opening from 9 p.m. to 11 p.m. on the first and third Saturday of the month. The Museum can be opened by appointment at times other than those indicated. 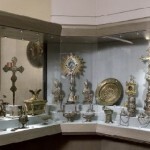 Guided visits to the Museum and Parish Church are available.